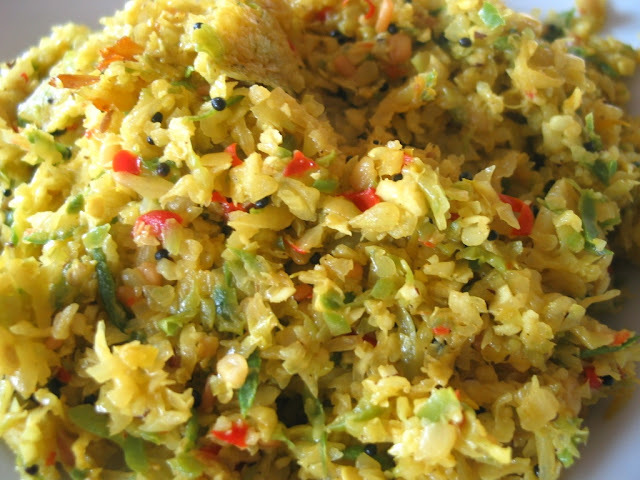 Thoran is one of the staples of Kerala Cuisine. My favorite combination is cabbage and carrot.I love beetroot thoran too .This time i had come tops and bottoms of a few capsicum in refrigerator leftover from previous days chowmien recipe so i have used it with cabbage. 1. Coarsely grind coconut,chilli,cumin,turmeric together and keep aside. 2. Heat oil and add mustard . 3. When it starts to pop add urad dal and then onion. 4. Cook till onion turns golden and add curry leaves and coconut mixture. 5. Mix well and cook for a minute. 6.Add cabbage , capsicum and salt and mix thoroughly. 8. Uncover mix and cook for 1-2 minutes. loved ur blog...liked the simplicity.